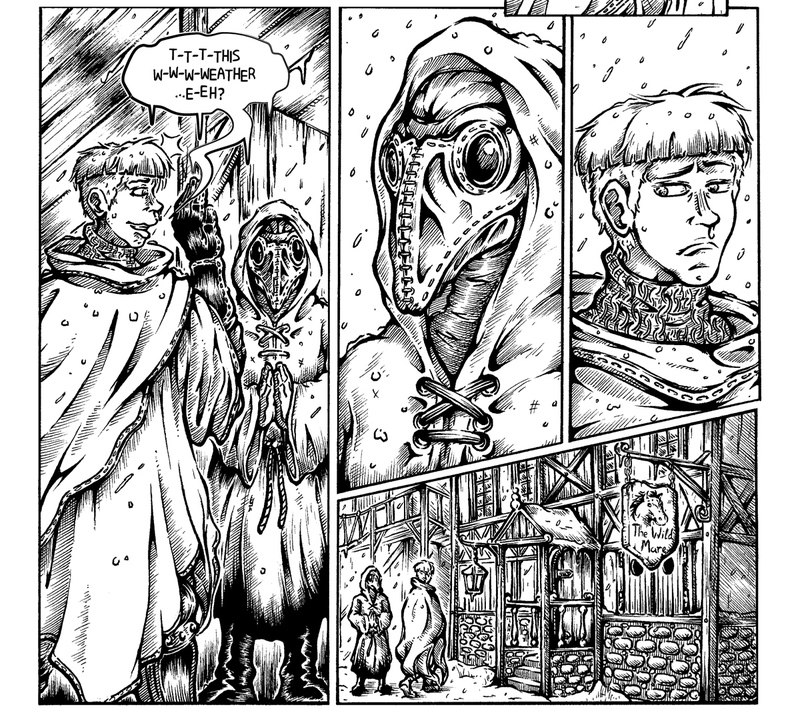 Apothecary Supreme Issue 2, Page 6 – This weather eh? A longer break in uploads than I would have liked (no surprises). The good news is that through my offline fumblings I have somehow built up a few more pages to share and will be back on the regular Sunday uploads… for a while. I’ve been missing Burkhard’s stuck up goofiness, so at the very least it’s good to have him back on the page! Plus, more creepy strangers! And so our new horror scenario and mystery antagonist are primed! Before we continue with this ‘wild trip’ (and bring back a few familiar faces) I’ll be taking a short breather in the uploads. My backlog is getting a bit thin, so I thought now might be a good spot to slow-up while I ensure the next bit of story maintains a decent flow. That said it won’t be too long! There’s stuff I frankly can’t wait to draw so I’ll power ahead ASAP. As usual producing pages is in a constant battle with IRL stuff but hell, who doesn’t have that excuse? TLDR: Less talk, more drawing. In all seriousness though, I slowed to halt on this one due to being in something of a dark place at the time. Normally I’d revel in drawing stuff like this, but it was definitely the wrong time in my case. A few folks said my last issue was a bit light on actual horror, so I’m getting right into this time around. Hopefully the scenario I’m presenting here is a substantial departure from that of issue 1. You are currently browsing the archives for the Production category.